Friendship | Why so serious? This post is for my dear friend Ann Koplow. For more details on our wonderful new superhero Super-Recovery-Woman read Ann Koplow’s post Day 474: Superwoman (not) ,Day 475: Superhero names (hyphenated or not), Day 476: Ka-plow!, Day 479: Super Recovery Woman, revisited. 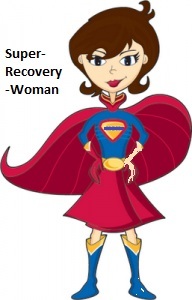 Ann Koplow and her friends has so far decided the corrected way to write Super-Recovery-Woman. Her superhero logo (-) . The purpose of this post is to share this picture . I wanted to post it in comment but didn’t know the procedure . It matches the description of Super-Recovery-Woman. You know, I’ve been thinking … I’m wondering if we can combine our super powers and post that picture you created. Ann , I hope you don’t mind . My editing skills are not advance enough . Replacing one boot with a sock would have been difficult . I was afraid it would result in deformed leg . In life we meet different people. Some people become our closest friends others are just faking it for their personal gain and then there is a third category . But what is the major difference among these three categories and which one is the most dangerous one ? Friends: Friends are people who you can trust .They know you and accept you in their circle of trust . They care for you and are there to help you . Its a two way process. You must reciprocate their feeling and support . Fake: This category is the most dangerous one . These people are pretenders . They pretend to care for you but they have some other motives .They want something from you and once they get what they want they leave you . You become invisible to them as if you do not exist anymore . Foe : These people hate you . They may want to cause you harm but atleast they are honest about their feelings . We must learn to identify our real friends and the fake ones . Untill and unless we learn to differentiate between these two we will make the mistake of spending too much time and energy on our fake friends .